President George Manneh Weah has sent a congratulatory message to the Government and people of the Republic of Ireland, on the occasion marking the official observance of St. Patrick’s Day, which also commemorates the National Day of Ireland. St. Patrick’s Day, or the Feast of St. Patrick, is a cultural and religious celebration held on March 17 each year, to commemorate the traditional date of the death of St. Patrick, the foremost patron saint of Ireland. According to a Foreign Ministry release, in the message to his Irish counterpart, His Excellency Michael D. Higgins, President George Manneh Weah conveyed, on behalf of the Government and people of Liberia, and in his own name, warmest felicitations and sincere best wishes to the Government and the peace-loving people of Ireland, as they commemorate this historic event. “Joining you in this celebration, permits us the opportunity to reflect on the harmonious bond of amity subsisting between our two countries, characterized by sincere cooperation and friendship which has recorded exponential growth in recent years, thus is enabling us to deepen engagement to unprecedented height”, President Weah declared. The Liberian President further stated that it is in the spirit of the friendly bilateral engagement between Liberia and Ireland that his government affirms the significant progress made in the two countries’ bilateral relations as befitting. 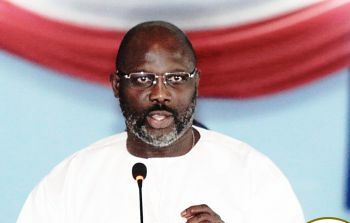 Furthermore, President George Weah says with the unveiling of another strategic European diplomatic mission near Monrovia, the Embassy of Ireland, and its associated five years Strategic plan, Liberians are reassured of the Irish government’s readiness to fully support the country’s Pro-Poor Agenda for Prosperity and Development. The Liberian leader then wished for his Irish counterpart continued good health and peacefulness, and for the Government and people of Ireland, sustained economic growth and prosperity as it awaits the outcome of BREXIT.